Author(s): Afshan Zeeshan Wasti, Department of Biochemistry, Jinnah University for Women. Karachi,, Pakistan	Nikhat Ahmed, Hajira Karim, Amna Ahmed, Ayesha Khan. Objectives: Bio-informatics methodologies have made possible to profile the global composition of tissue or organelle at a specific point or under particular developmental or disease state. In schizophrenia, research has extensively focused on identification of the alterations associated with gene and protein expression profiling. An additional target of the present study is the assorted mechanisms by which post-translational modifications can regulate these functions. As phosphorylation, s-nitrosylation and glycosylation are the familiar post-translational modification; the phosphorylation offers a foremost regulatory system due to the high variability in the protein structure, particularly flanking amino acid residues, the reliable prediction of these sites still remains a vital issue. Post-translational modifications modulate protein's cellular function critically involved in cell signaling and regulatory mechanisms in the molecular context. The gene mutations greatly influence these modification sites and believed as a disease biomarker. 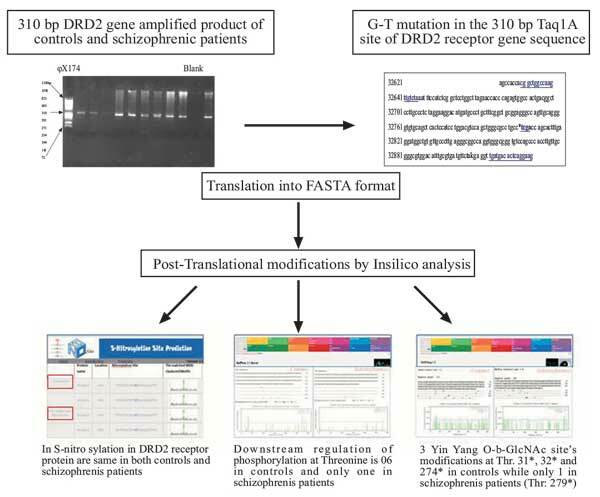 Methods: The present study illustrates Insilico analysis approach to predict possible posttranslational modifications in dopamine receptor D2 (DRD2) protein in previously identified G-T mutation in the 310 bp Taq1A receptor gene sequence in the Pakistani schizophrenic patients as compared to normal healthy controls. Results: The significant changes were observed, particularly the down-regulation in phosphorylation and glycosylation sites in G-T mutated sequence of the schizophrenic patient as compared to healthy controls. However, no change observed in nitrosylation sites in both groups, suggests that this downregulation or loss of modification target sites may be associated with the disease consequences. Conclusion: Current study expressed remarkable results that propose unique possibilities to investigate post-translational modifications at gene / protein level could further enhance understanding towards the biological function that altered during schizophrenia progression. Keywords: Bioinformatics, DRD2 receptors, insilico analysis, post translational modifications, schizophrenia. Keywords:Bioinformatics, DRD2 receptors, insilico analysis, post translational modifications, schizophrenia. Abstract:Objectives: Bio-informatics methodologies have made possible to profile the global composition of tissue or organelle at a specific point or under particular developmental or disease state. In schizophrenia, research has extensively focused on identification of the alterations associated with gene and protein expression profiling. An additional target of the present study is the assorted mechanisms by which post-translational modifications can regulate these functions. As phosphorylation, s-nitrosylation and glycosylation are the familiar post-translational modification; the phosphorylation offers a foremost regulatory system due to the high variability in the protein structure, particularly flanking amino acid residues, the reliable prediction of these sites still remains a vital issue. Post-translational modifications modulate protein's cellular function critically involved in cell signaling and regulatory mechanisms in the molecular context. The gene mutations greatly influence these modification sites and believed as a disease biomarker.